Upkari means a side dish in Konkani. Cabbage Upkari is very simple and tasty. This recipe can be made with not only cabbage but with any veggies like beans, snake gourd,potato or pumpkin. 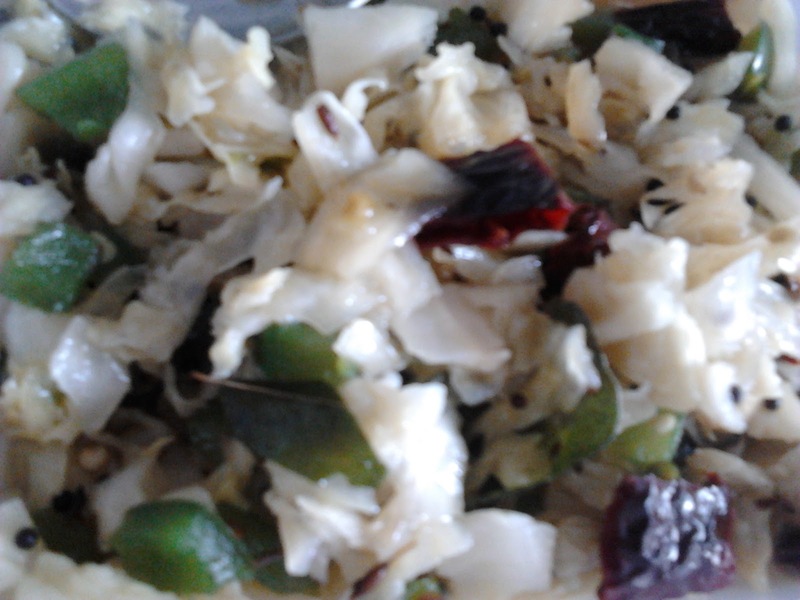 Cabbage Upkari is a side dish for lunch or dinner. Don't add water as cabbage leaves little water on cooking or use steaming method by covering the pan with a broad plate/thali instead of lid and adding some water on top of the plate so that the water in the plate doesn't allow veggies to get burnt or stick to the bottom of the pan. People who are diet conscious can skip adding coconut. Optional - Can add 1/2 tbsp turmeric powder and a pinch of asafoetida. Cabbage with grated coconut has a low life span so consume within a day or refrigerate. Cabbage cooks much faster than any other vegetables so be careful. Add mustard seeds,cumin seeds and curry leaves. When mustard seeds pop up, add red chilies, green chilies and cabbage. Mix it well. Add salt as per taste and close the pan with the lid on low flame. Once the cabbage is cooked, turn off the flame and garnish with grated coconut.